This week, millions of students across New York will begin taking the state’s annual round of standardized tests, starting with the Common Core English Language Arts test on Tuesday. But it’s not just students’ performance that will be graded — teachers are being evaluated just as much, if not more. While 30 states require test scores to be considered in teacher evaluations, New York stands out in just how much weight it may soon be putting on the scores. In March, the state legislature approved a hotly contested measure backed by Gov. Andrew Cuomo that takes away district control of teacher evaluations and could allow the education commissioner to use test scores to determine as much as half of a teacher’s evaluation, giving test scores and observations the same weight. Legislators seem confused about the practical implications of the bill and are investigating the language. The education department has until June 30 to finalize the evaluation system. The bill is just the latest in a flurry of teacher evaluation policy reforms that have been implemented across the country in recent years. New York had already reformed its teacher evaluations in 2012, but after 96 percent of teachers were deemed effective last year, Cuomo is looking to rework the system again. According to the Center on Great Teachers and Leaders at American Institutes for Research, a nonprofit behavioral and social science research organization, every state but California has developed plans for a new system to be implemented at some point between 2011 and 2019. These new models of teacher evaluation include state tests, district tests, classroom observations, student and parent surveys, self-assessments from teachers, lesson-plan reviews, measures of professional learning, and more. One New York principal, Carol Burris of South Side High School in Rockville Centre, who is also a fellow with the nonprofit National Education Policy Center and who has been an outspoken opponent of high-stakes testing, said that New York’s policy will affect students for the worse. In Burris’s ideal world, test scores would play at most a secondary role in teacher evaluations. “I think the role of test scores should be outside the model. Teachers should be evaluated by their principal, and if for some reason that evaluation is way off the mark, then decent test scores can be used as a form of protection to challenge that evaluation,” she said. Hull understands her anxiety about the new policy. “There’s definitely room for concern when you talk about 50 percent of an evaluation being based on test scores,” he said. “Especially if it’s not a high-quality assessment [of the students] and doesn’t assess a broad range of knowledge.” The quality of student tests is a particularly sticky issue in New York, where the first two years of Common Core test results, which have shown outsized gaps between demographic groups, have done little to ease critics’ concerns that scoring well on the tests requires skills that are irrelevant to the subject matter being tested. 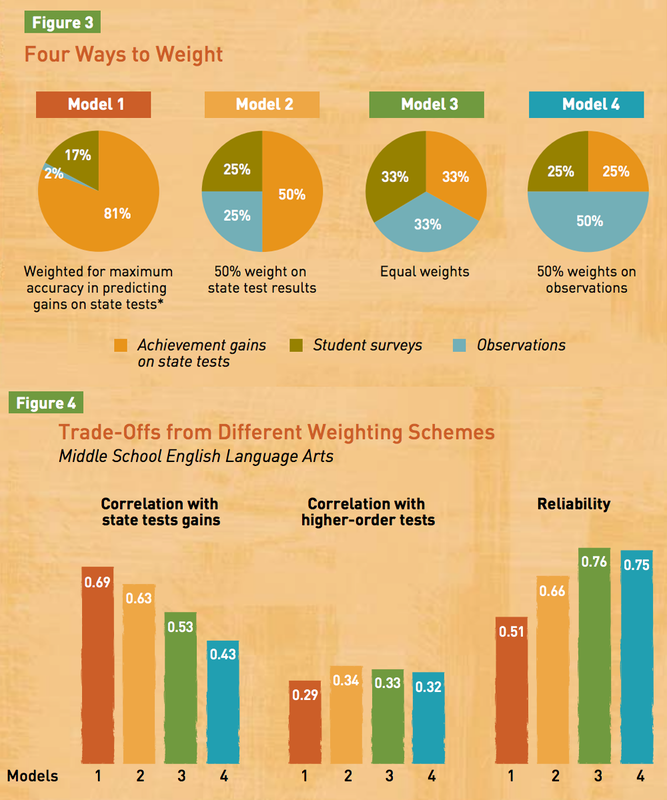 Texas is in the process of overhauling its evaluation system, and it will value test scores at a maximum of 20 percent — even less than the MET Project’s Model 4. Specifically, Texas’s new model will count “student growth” as 20 percent of a teacher’s score. “But there are four options that districts have for measuring student growth, and just one of them ties back to test scores,” said Tim Regal, the director of educator evaluation and support for the Texas Education Agency. Texas’s new model, which will replace a 17-year-old system, is in its pilot year and being implemented in 57 districts. Next year, it will expand to 200 districts before the final statewide implementation in 2016-2017. In addition to the 20 percent of teachers’ evaluations that will be based on student growth, another 70 percent will be based on observations from principals, assistant principals and other campus leaders, and 10 percent will be based on self-assessment. While New York is putting even more emphasis on testing, most states are moving toward a system more like the one in Texas.